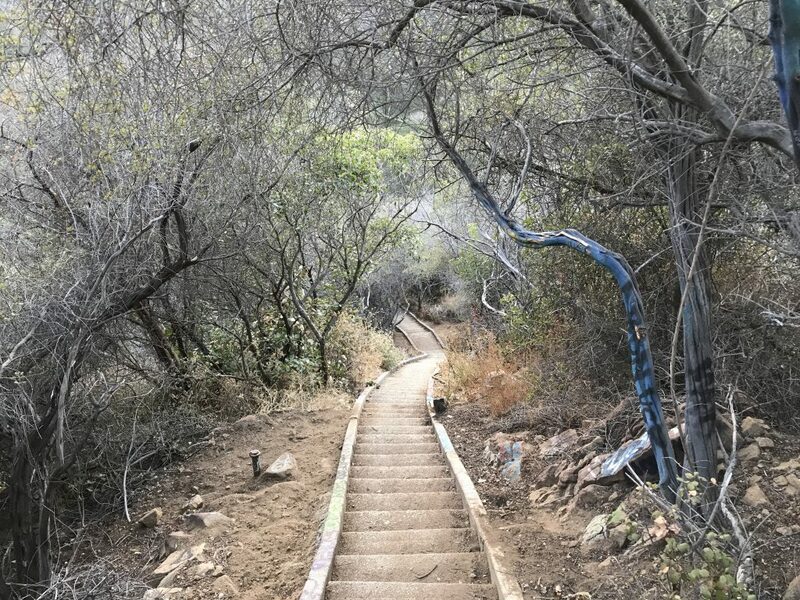 Murphy Ranch trail is a 3.4 mile there and back loop located near Pacific Palisades, California. 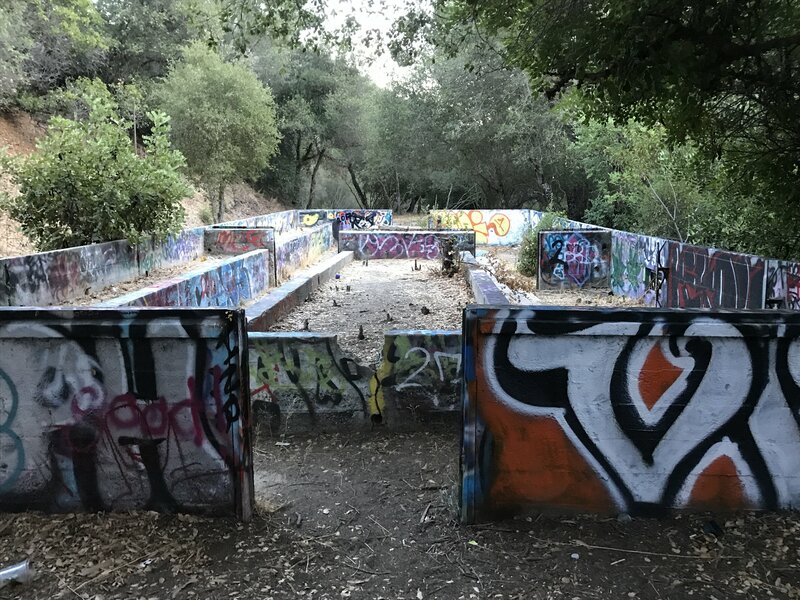 This moderate trail is Instagram famous for skirting around an abandoned compound covered in graffiti. There are no restroom facilities available on Murphy Ranch Trails. Hike Distance: 3.5 miles round trip. 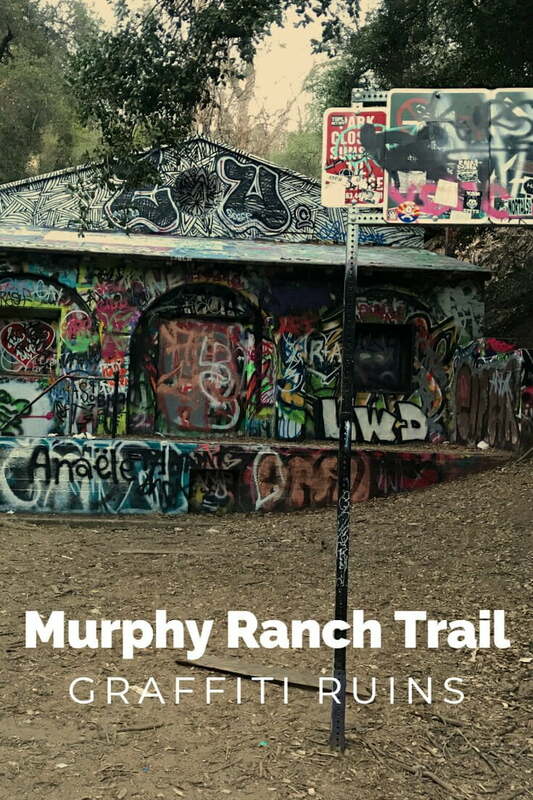 Murphy Ranch Trail is located within Murphy Ranch Park. 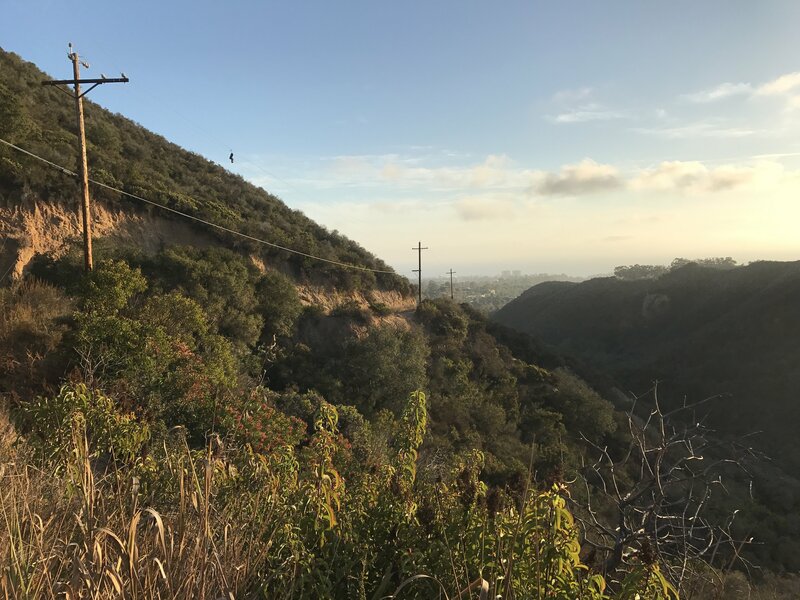 It all began at the relatively sunny hour of 4 pm in mid-November when I embarked on the Instagram famous Murphy Ranch Trail. 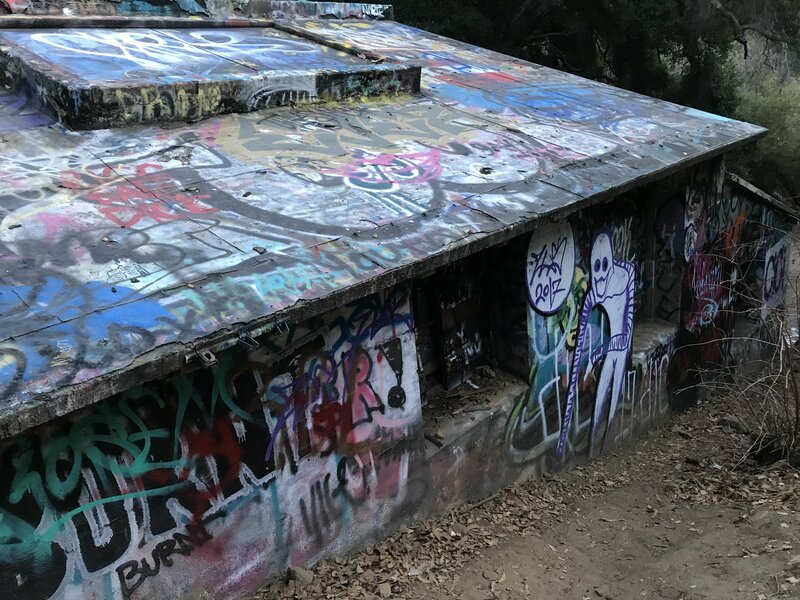 And it’s famous for a reason: The graffiti-filled ruins contain a wealthy amount of American history as the trail was actually the base of a 1930’s Nazi Compound. The trail starts out on a rather wide road amongst a vast mountain range that forks about a half a mile in. You have your choice of choosing a staircase on your left, or to continue down the paved road straight ahead. To say that this staircase was long is a bit of an understatement. 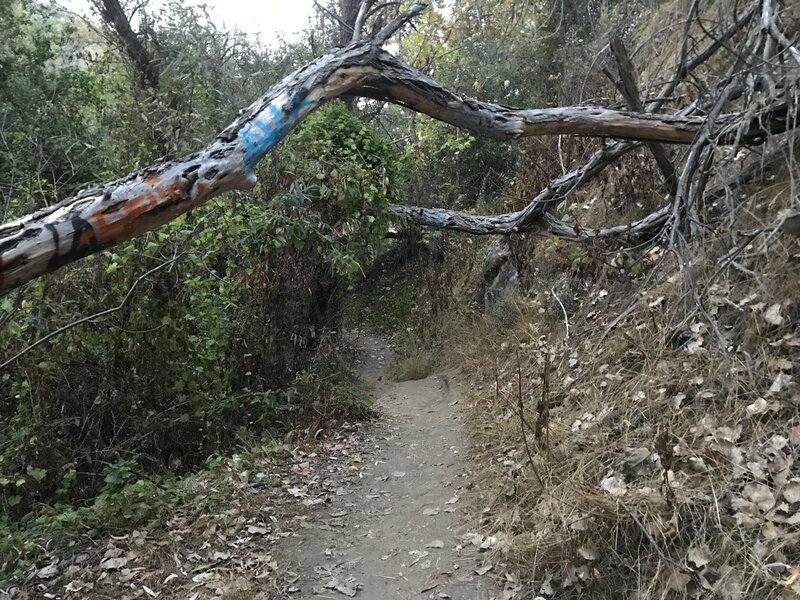 Anytime I think “OK, this can end already” is usually a sign that the particular trail or workout is going on a bit too long. And that phrase ran through my head no less than ten times. 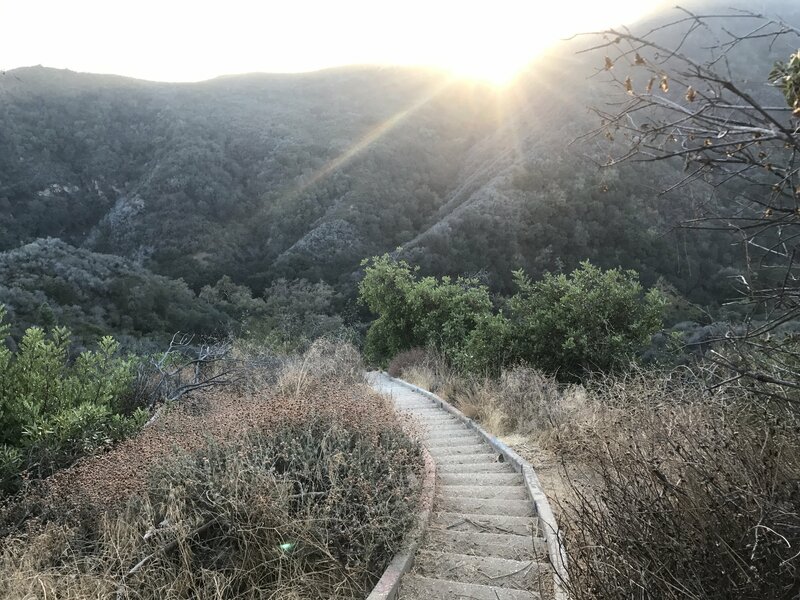 But the steep and slightly dangerous staircase was quickly offset by the sheer beauty of the Santa Monica Mountains as the sun began to set for the day, casting glimpses of light upon the never-ending array of trees. 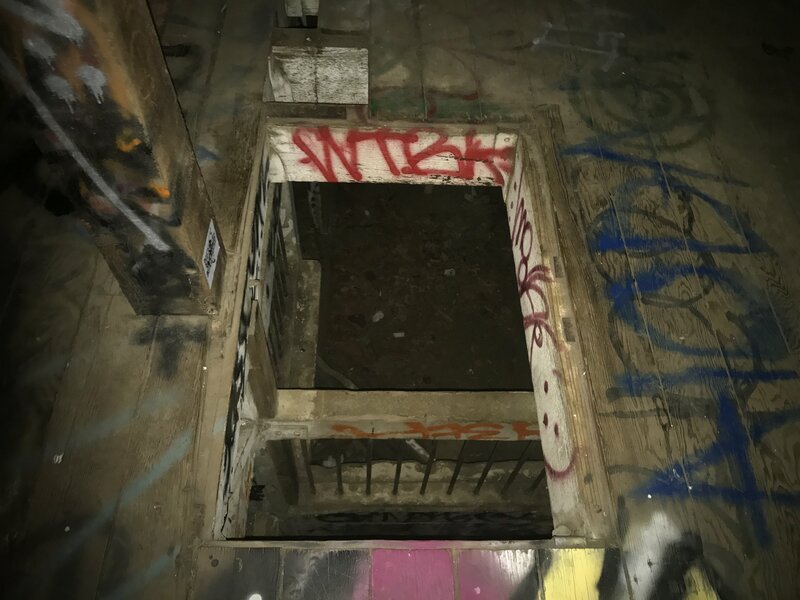 It was at this point down the stairs that I began to really wonder…What lies beyond the descent? Just shy of what felt like a half million steps, I finally make my way down the staircase to find a short trail within the woods. This trail leads to an open area with yet another paved road that forked off. 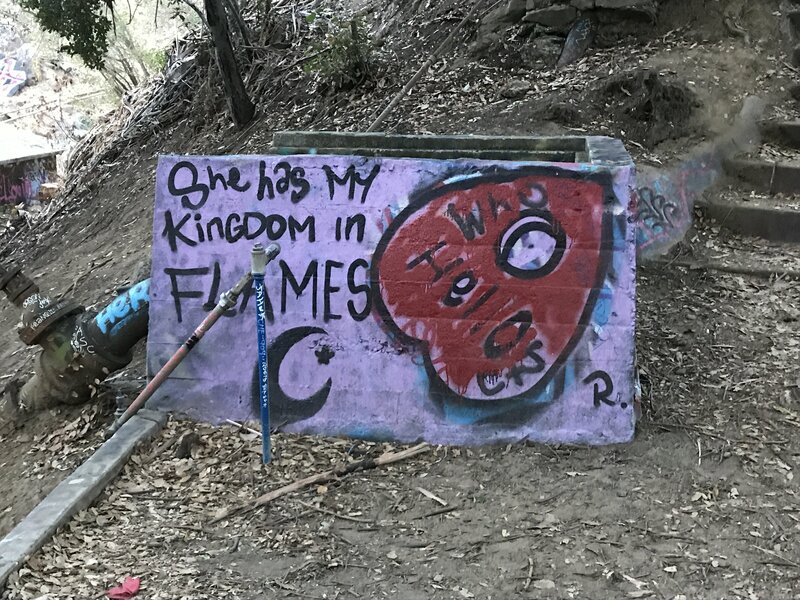 I chose to go left because there was graffiti to be examined, while the right side of the road failed to make a case for itself. 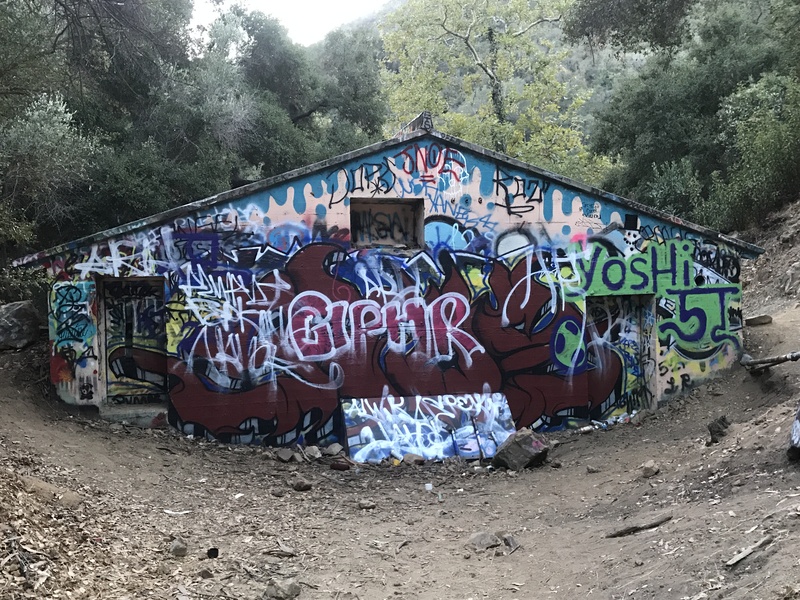 I follow the leftmost fork down about a quarter of a mile to find exactly what piqued my interest in the first place: Graffiti-filled ruins of Murphy Ranch Trail. Someone must have had quite the free time on their hands because there was graffiti everywhere, most notably on scrap metal, trees, and cemented ruins. 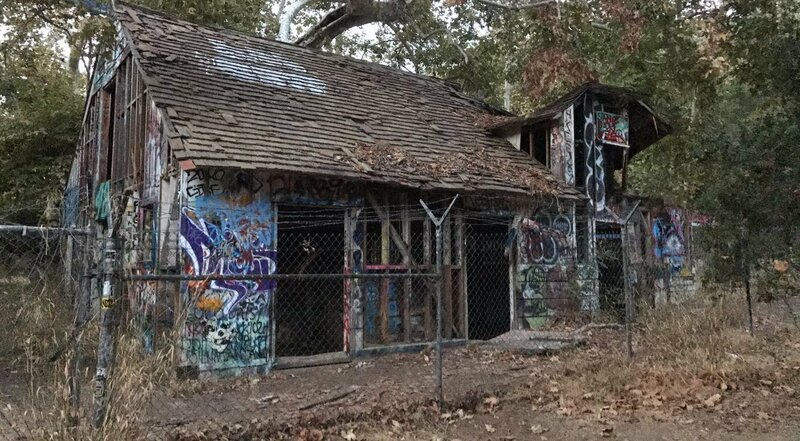 The most mesmerizing aspect was how the bright colors popped against the neutral aspects of the forest, and how ironic it was that a once war-torn compound has now been painted happy. 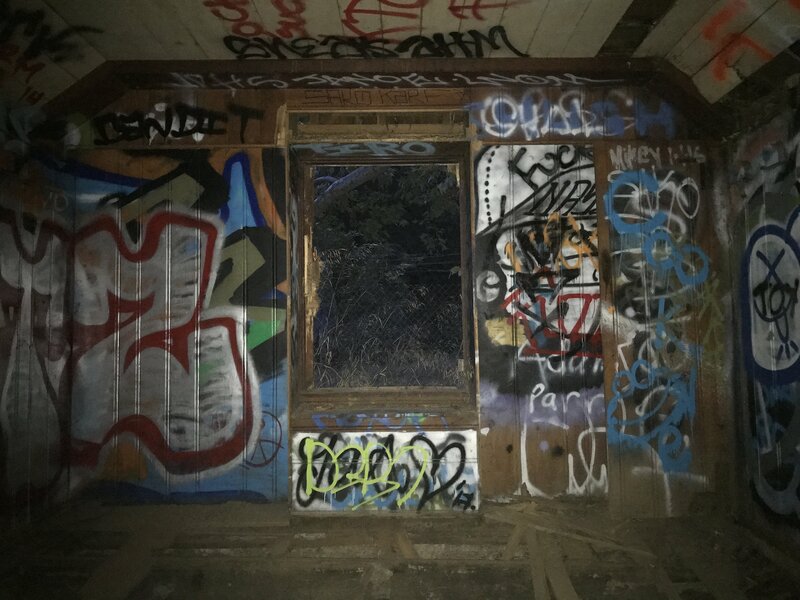 Overlooking the ruins was another peculiar sight to behold: An abandoned house, plain as day within the woods. Upon closer inspection of the trashed surroundings, I come to find that the entirety of the house is completely boarded up. What a pity indeed…it would have been such great fun to explore such a creepy interior. The back of the house; Can you spot the snowman? 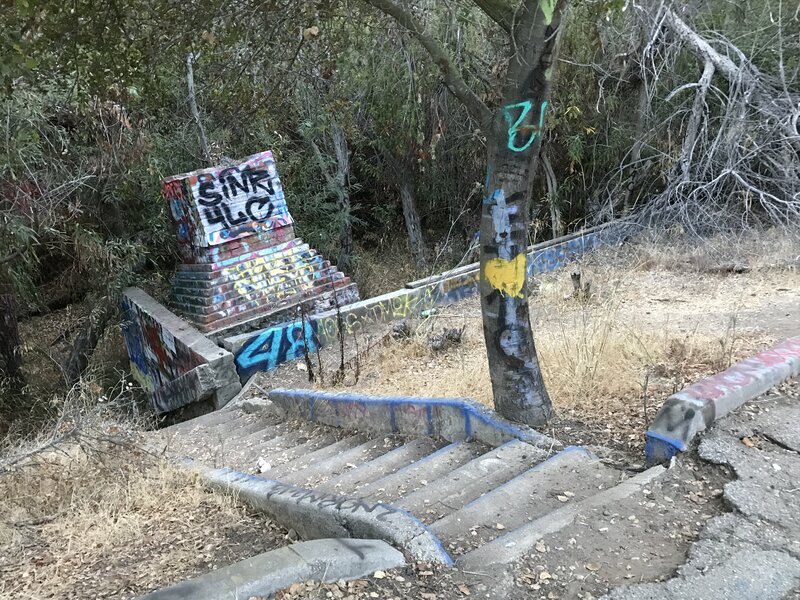 After spending quite a bit of time exploring the perimeter of the Happy House, it was time to make my way through another tangent of the hike. I could have chosen to go up the small staircase within the ruins above the house, but I decided to continue down the same path I was on. 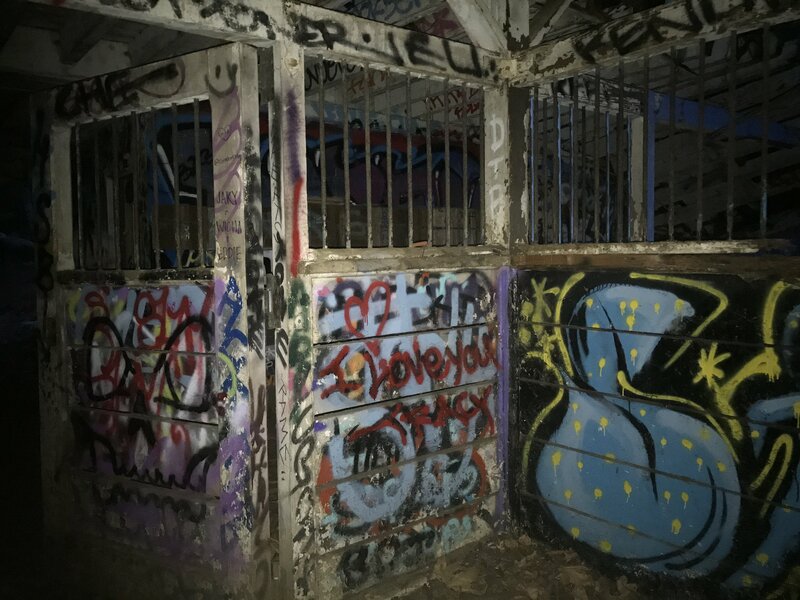 I gawked at another graffiti-painted structure (albeit a rather small one) as I descended deeper into the woods. 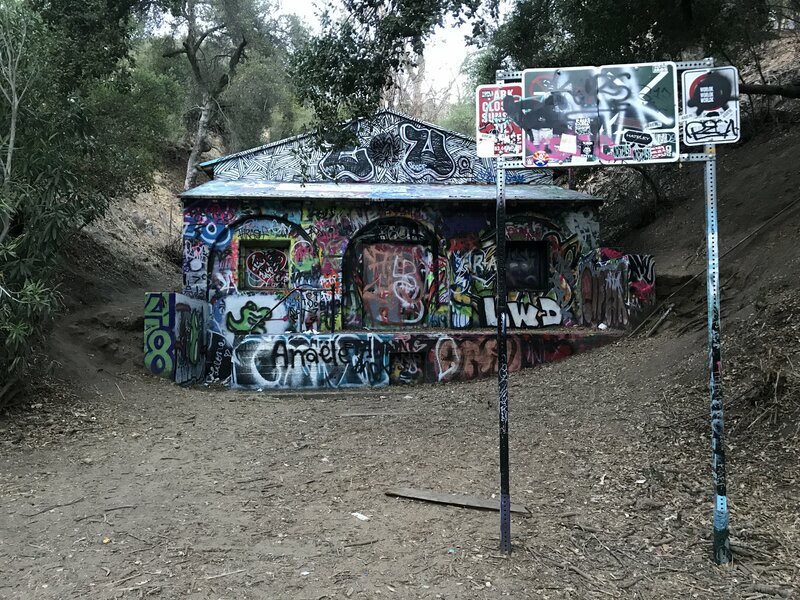 After telling myself “OK, this can end already” about 3 times, I finally come across what I consider to be the treasure of the Murphy Ranch Trail: An even better Happy House! 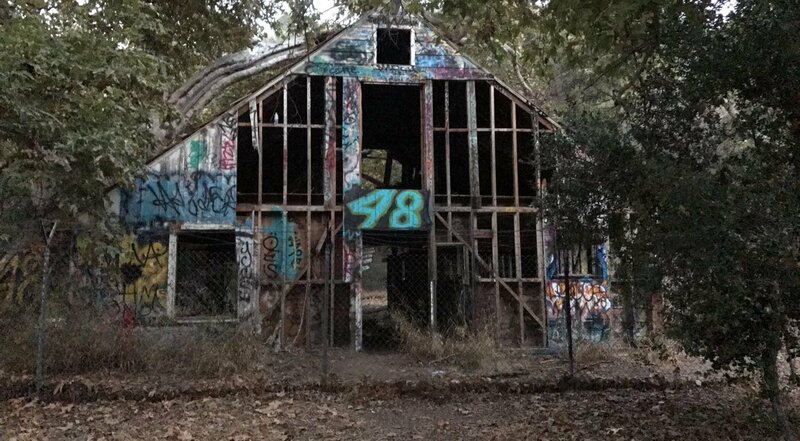 But this house didn’t look so happy, even with graffiti plastered all over it. 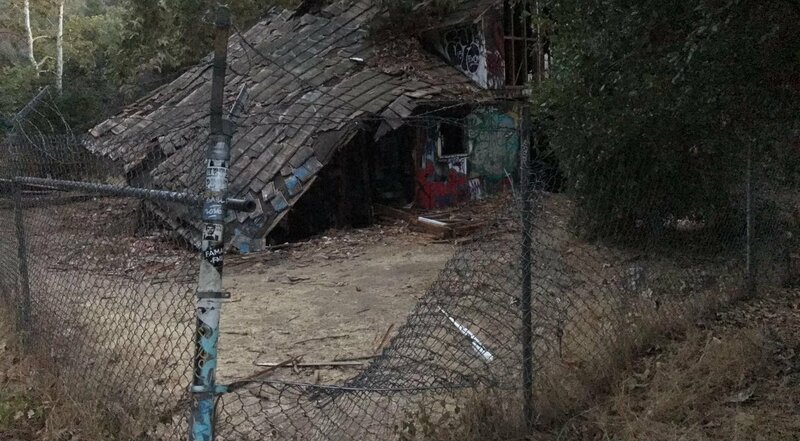 There was something sinister and unsettling about this semi-demolished structure, most likely due to the barbed wire fence surrounding it. Of course, this doesn’t stop me from investigating both the outside and inside of this house. 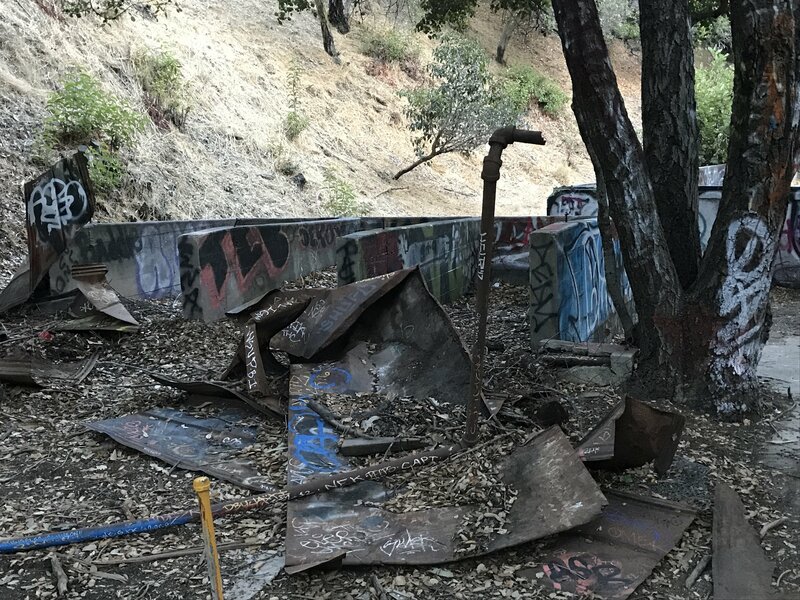 While the perimeter was fenced off, it appears a certain part of the fence has been bent enough to allow hikers to enter. Let the CSI premiere commence. 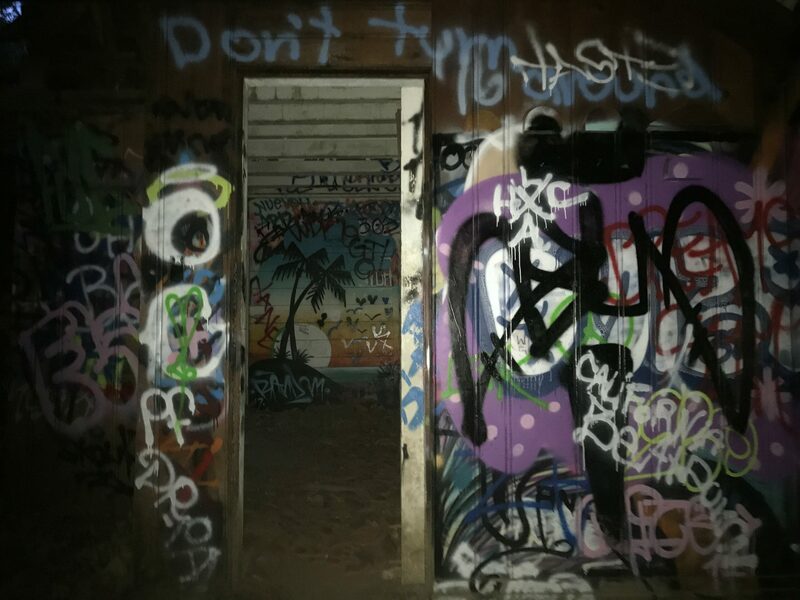 I illuminated the pitch black interior with the flashlight on my iPhone, uncovering more stunning graffiti artwork. 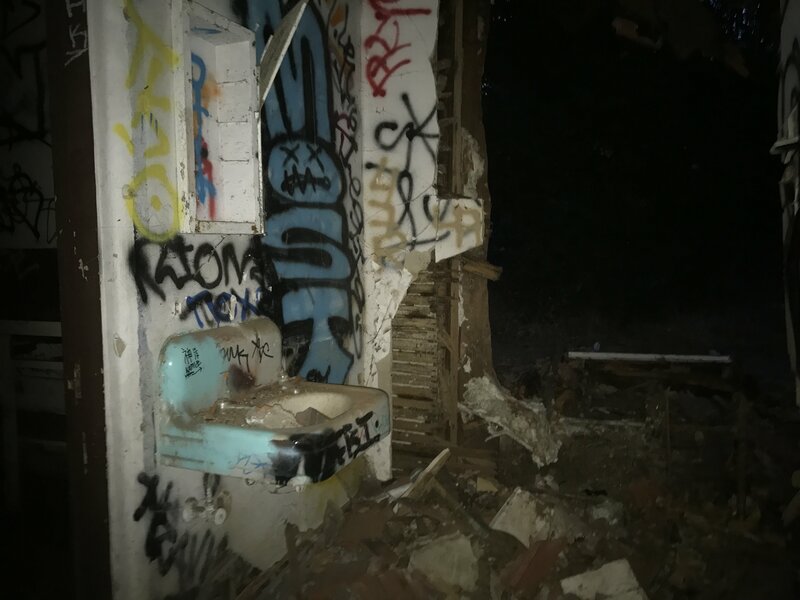 This was a two-story house with about 4 small rooms on the first floor, including a bathroom of some sorts. There were also 3 jail cells, perfect for those annoying in-laws in your life. 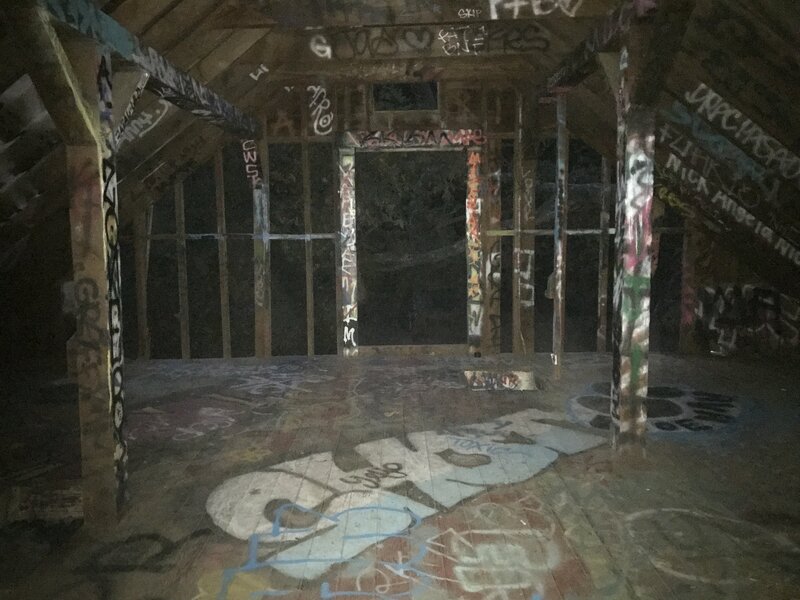 The second floor of the house had even more graffiti artwork plastered on the wooden walls and floorboards. There were also quite a few gaping holes in the floor, so the phrase “watch your step” is definitely meant to be adhered to. I left the house to begin my way back at about 31% battery life, which I thought was enough juice to at least get up to the top of the staircase, if I made haste. Since it was the lovely month of November, where the sun decides to call it quits at about 5 pm, it started to get pitch black, fast. Due to the lack of light within the woods, I had no choice but to keep using the flashlight on my phone, draining the battery even more. I swiftly made my way back through the long trail, past the first Happy House, and through the paved road to find myself back to the approximate area from where I initially descended down the staircase. And here’s where the real fun began: I couldn’t find my way back to the staircase. I was within that fork, trying to find that “short trail” within the woods. The problem was that there were many “pseudo” trails that seemed to be the correct path to follow but ultimately lead to a dead end. 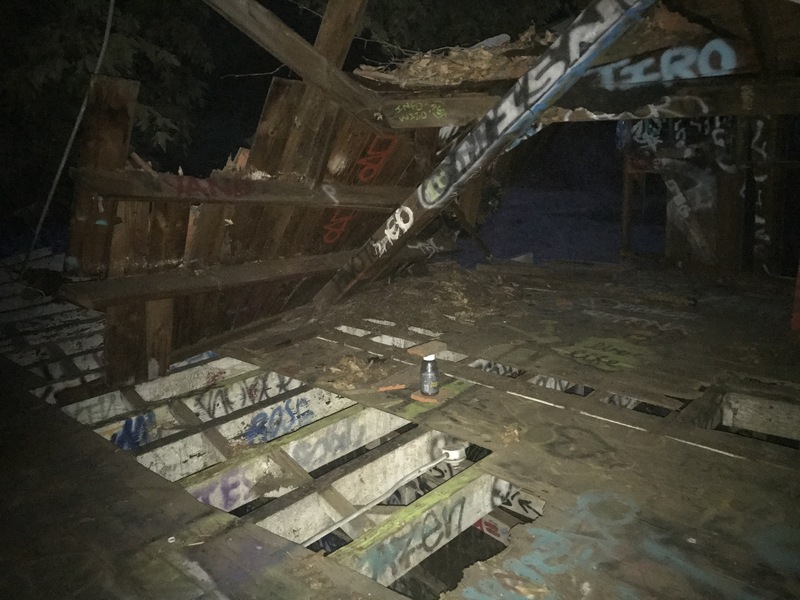 Furthermore, the flashlight could only illuminate about 2 feet in front of me, and with the battery draining at an unexaggerated rate of 1%/minute, I began running through the woods to try and find the staircase. After a few minutes of panic, the battery was now at about 21%. Without a light source, signage, or any human contact nearby, I would be forced to spend the night alone in the woods if I didn’t find my way back. What’s funny is that this entire scenario felt like a re-creation of one of my favorite horror films, The Blair Witch Project. I was aimlessly running around the woods only to find myself back at the exact same spot I was trying to get out of. My heart begins to race. I was cold and without any food and barely any water. 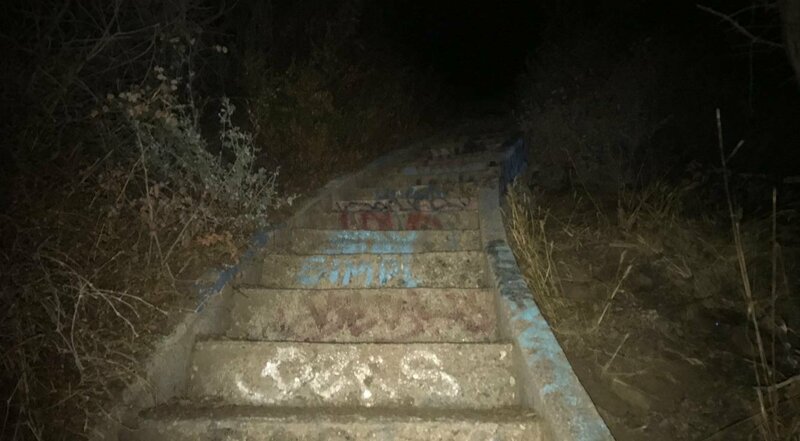 I begin to question what I can do to find this trail, if there is a way at all. On a side note, I’m a firm believer in thinking outside the box to find a solution out of any sticky situation, and this scenario was no exception. And so, in a shear mode of panic and fear, I found the solution. I needed to retrace my steps from Point B to Point A, and I mentally could not remember (and quite frankly, I couldn’t see) where the trail was. But my photo album could. With 19% battery life remaining, I began sifting through the 9500 photos on my phone to find that one gem of a photo that could show me where the initial trail was. I knew I didn’t have much time left; The act of browsing through the photos on my phone was decreasing the battery life even more. I took this picture when I walked out of the short trail and into the new area that forked off. The vantage point of this photo showed the graffiti wall to my left, which clued me in on exactly where to go. I sprint towards the vantage point in the photo to thankfully find the very trail that led back to the staircase. “Thank the heavens,” I thought. I began my ascent up the stairmaster of hell, adrenaline pumping through me like a superhuman. Halfway up the stairs, the inevitable happened: The battery died. At 15%!! Thankfully, it wasn’t too dark since some of the city lights from above offered a speckle of light to guide me. That, and my night vision kicked into high gear. I made my way up the rest of the staircase, exhausted and ready to get back to my damn car already. Reaching the top of the staircase was the equivalent of watching a protagonist of a movie making it out alive of some horror infested freak show. And I’d like to think I’m the hero of my life every now and then. 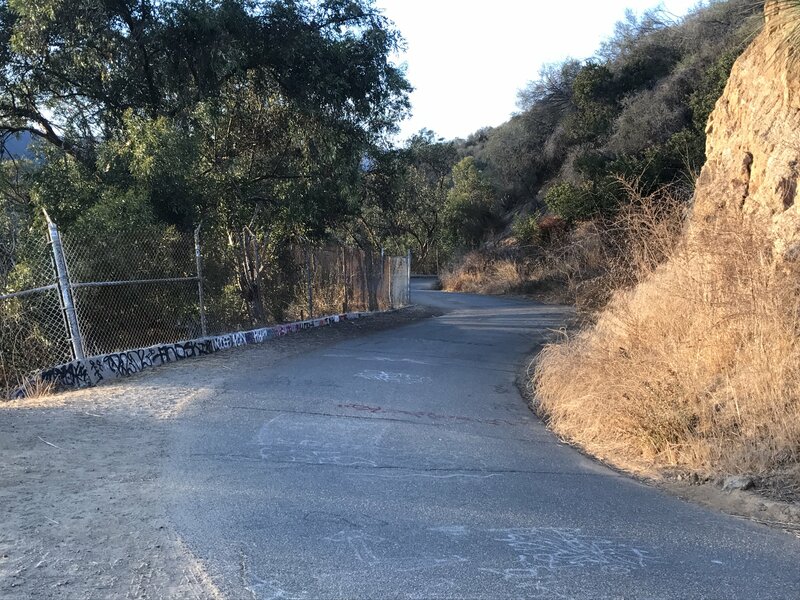 I forked right and made my way through the initial paved road towards the beginning of the Murphy Ranch Trail, the city glistening beyond the Santa Monica Mountain range as I felt happy to see civilization for once in my life. After about 45 minutes, I finally reach my car, with feelings of exasperation and joy that I didn’t have to spend the night in the woods. My mind races, replaying everything that just happened. From the time I found my way back to the staircase to the time my phone battery died was a difference of 2%. In other words, 2 more minutes in the woods and I would have been a goner. I think for a moment on what to do for the rest of the night, debating on whether or not I should go home, or find another adventure to embark on for the evening. A few minutes pass before I decide to turn the ignition on and proceed to drive for Lyft for 2.5 hours. After all, I’m already in a hot spot of the Santa Monica area. Or rather, a night I’d like to forget. 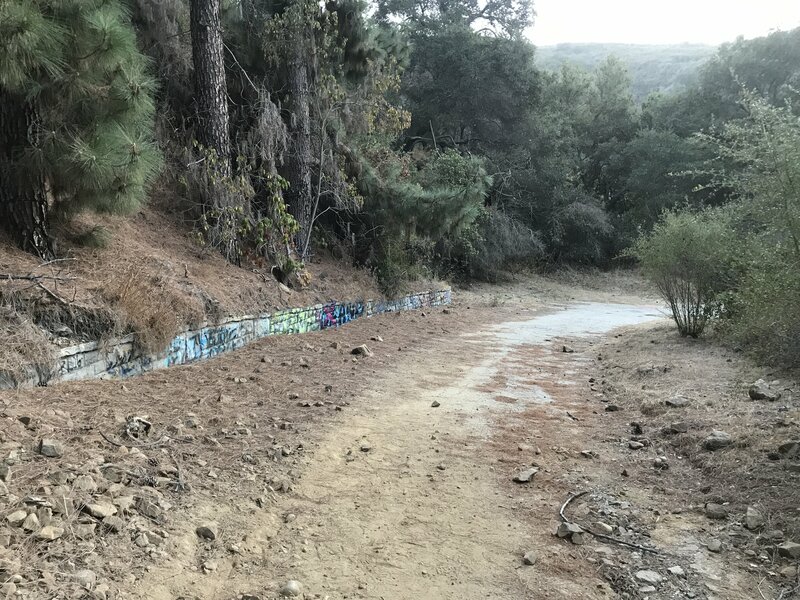 Thanks for reading about our Murphy Ranch Trail, we’d love to hear about your trip – post your comments & feedback below!